I stumbled across a quirky issue todayÂ which was causing scheduled TFSBuild jobsÂ to fail with the following error: â€œUnable to read data from the transport connection: An existing connection was forcibly closed by the remote hostâ€. When executing the build definition manually I could not reproduce the issue; the build would run through without any errors. After a bit of searching it turns out there is a small bug in IIS 7.5 (introduced in Windows Server 2008 R2) which prevents TFS downloading files larger than 2MB over a slow network connection; IIS will expire the idle connection time-out and disconnect mid-transfer. Installing KB981898 from Microsoft Support will fix this bug and allow TFS builds to run-through without any issues. Yesterday (and possibly the day before) a lot of commotion was caused when people started getting “Trial Period” notices appearing when using Windows Live Mobile Messenger. 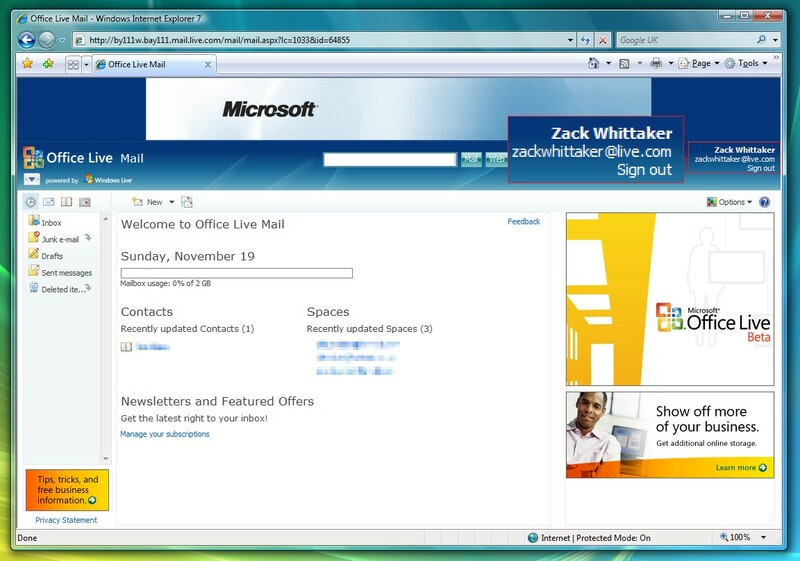 Here is what actually happened: Microsoft rolled out a direct-to-consumer billing service for the Windows Live client on Nokia S60’s in the UK and Sweden. The only problem was that not just Nokia S60 users got the message but everyone using the Live Service. As you may know, we offer Messenger services through mobile operators on lots of handsets, not just Windows Mobile. Traditionally, customers have been billed by their mobile operators for many of these services, either directly or through their data package.- Matt Champagne, director of Windows Live mobile services. Microsoft are considering adding the “direct-to-consumer billing service” to everyone in the future the finial decision has not been made yet. So…If you were on a Windows Mobile device and not a Nokia S60 and received the message by accident-ignore it! Server 2003 Critical Patch KB929969=Critical Problems! The fact of the matter is that many Server 2003 System Admins are in for a surprise when they reboot their servers after 1/12/2007, if they have automated updates enabled. Your first clue is that your Manage My Server screen will not work and you will get a Script Error complaining about the mys.dll/mys.hta. Any attempt to open Computer Management, Enterprise Management, DeviceManagement…etc… will result in an error saying that mmc cannot find the *.msc file. IIS and SQL server will fail.Â Any time you hit Cntl F or Search, it will fail. So what did this patch do to your server?Â It removed a file. C:\Windows\System32\msxml3.dll was replaced by msxml4.dll, but this file doesn’t replace the msxml3.dll file effectively. Reboot the system and your server should be fine. It seems like thisÂ Update from Microsoft has caused System admins all around the world nothing bug problems. But until this update is less buggy it looks as though a lot of servers will remain MS07-004Â unpatched. Microsoft has received and acknowledged that a new 0-Day exploit is public, and the proof-of-concept code announced for it is valid today on their Security Blog. The proof-of-concept code targets the CSRSS (Client/Server Runtime Server Subsystem) the part of windows that launches and closes applications, the exploit affects all versions of Windows including the (un)released Windows Vista. Tested on XP Service Pack 2 the proof-of-concept will cause the computer to crash resulting in a system lockup, system failure (Blue Screen of Death), or simple hard reboot. This is good news for users, as a patch is coming. The potential for attack, rated less critical by Secunia is still problematic if the system is infected by rootkits, or applications designed to allow remote access to a PC. The method of attack, and the way this exploit works, means there is no real protection for end users, other than to ensure you are fully patched, and your malware, spyware, and virus scanning software is running and up to date. This has got me puzzled, flummoxed, baffled, confused, mystified andÂ perplexed… if you would. See if you can try and explain this one because I certainly can’t. Â address, in this instance isÂ Â and I’m using Windows Vista RTM. Â same Â account except I’m using a different machine. Computer World reports that PC manufacturersÂ which hadÂ expected to get their hands on the final version of Windows Vista today will have to wait a couple more weeks for the operating system, according to sources familiar with Microsoft Corp.’s plans.Microsoft originally targeted today for Vista’s release to manufacturing, but a last-minute bug that “took most of the Vista team by surprise” caused an unexpected delay, the Vista team discovered the bug, which “would totally crash the system, requiring a complete reinstall,” in Vista Build 5824 on Oct. 13. The team fixed the bug a week later in Vista Build 5840, he said, but the delivery of the operating system to PC makers was delayed. Therefore the team is now targeting a new date of Nov. 8 for Vista’s release to manufacturing. Although this dosen’t change my perspective on Vista being a really great operating system-finding a bug at the last minute does put a damper on its credibility….hopefully that’s the onlyÂ hiccup and Vista will be the very best Operating System out there today. Is finally here! Go to https://connectbeta.microsoft.com/site/sitehome.aspx?SiteID=3Â and take a look around. You can do most of the things you can on the main Connect site, although you’ll find that the available programs list is pretty limited. None of the feedback or sites from the production site are available here, with the exception of the Connect demo site. Take a look around and see what you think. After you sign in, click the “Manage My Profile” link at the bottom and fill out your profile data in order to be able to submit feedback. Keep in mind that this is a beta site, so the feedback isn’t going to be processed or resolved. Don’t enter your real bugs here- or do, but enter them on the real Connect site as well! Â After you’ve taken a look around, if you have any comments you can file a feedback or suggestion form on the main Connect site at http://connect.microsoft.com/Connect/Feedback. A couple of notes about the beta site; some issues were found after the deployment to the beta site and have already been resolved internally. File uploads may not work correctly with Firefox 1.5. This is known and has been corrected in a later internal build. Feedback should work with both Opera and Firefox, although some display elements may not be correctly placed or visible in non-IE browsers. These issues have been largely eliminated in our internal builds. After attaching files, you may notice that the “attached files count” on the Feedback Details page always remains 0. This has been corrected in our latest builds. 3) Have a guess at what comes up. I find this rather strange because Google and Microsoft are like raaawwrrrr at each other because of sibling rivalry (unlike Apple which is most certainly the black sheep in the family, like the uncle we don’t talk about because he likes wearing women’s dresses and lederhosen for example). But then something like this comes about – I dredd to think what the PageRank is for Windows Live Search… if anyone wants to tell me what it is so I don’t have to bare the agony of installing Google Toolbar for my precious Internet Explorer 7, I’d appreciate it. Earlier this week a server on the backend of the WGA service experienced a bug that resulted in a temporary outage. As a result, some systems were incorrectly flagged as being non-genuine, and we want to confirm for those who contacted us about this that it was indeed an error.Â The WGA team hasÂ apologized for any disruption this may have caused for our customers. The bug that caused this issue was identified and fixed within twenty four hours of being discovered. Run wgatray.exe /b from the command line to ensure that the latest validation is updated for WGA Notifications.Â This command may be absent from the userâ€™s machine and should not be considered an error.Â Please ensure that this is run as an Administrator.Â A reboot may be required to remove all non-genuine notifications. The team haveÂ also implemented a webpage with special instructions that will receive any traffic from systems that are running on product keys that could have been affected by this issue. A KB Article has been written to further point the steps to take inorder to fix the problem. Generic Host Process for Win32 Service – crashes and burns, but why?!? Normally I don’t post “personal” entries on here, either to do with my personal life and/or personal problems I’m having with my computer(s) but this one’s being a right pain and I’m actually concerned that other people may be having it too. If you check out the Microsoft Online Crash Analysis (ID: 1501)Â then it explains basically what happens. As most of you know, the “Generic Host Process for Win32 Services” is “svchost.exe” in Task Manager. You’ll see that there’s usually at least 5 or 6 of them in Task Manager and it’s a very important service because it hosts other services and handles all the processes from DLL files – basically it’s a very important service and should never really be messed with unless you really know what you’re doing. I sometimes turn my machine on and it’ll give me an error report saying that the “Generic Host Process for Win32 Services had to close” and it’ll let me report it. After I do so, it’ll take me to the Online Crash Analysis site as given above. Now this has only seemed to have happened on my laptop but on 5 different sets of operating systems and/or re-installations, and the problem only seems to come about after I install all the updates that it gives me. I’ve got Windows XP Media Center 2005 installed at the moment with all the updates, and it still happens. Is it just my laptop, or is it actually an automatic update which starts screwing things up? There’s a fix available for this problem and it says that it’s a problem that happens when you install the update MS05-012, however it doesn’t freakin’ work! I’m really stumped to be honest – has anyone else got this error or seen it before? Has anyone got any information? Why the hell isn’t Microsoft doing something about it? Here’sÂ my system information here and obviously take out the “sensitive” data – if anyone wants to look at it, feel free and let me know if anyone’s got any ideas. Update by Jabez: According to a comment left by RRasco, the fix #2 fromÂ http://www.sizlopedia.com/2007/04/28/fix-generic-host-for-win32-process-error/Â worked for him. Give it a shot! A while ago Jabez Posted an article about FSRM: â€œAccess is Deniedâ€ is logged in Event Viewer,Â Browsing Our Friends blog over at “The Filing Cabnit” It seems some light has been shedÂ on the article as well as a small workaround. Please find most of the article below but dont forget to check out their blog to get the full story-You rock guys. MESSAGE File Server Resource Manager failed to enumerate share paths or DFS paths. Mappings from local file paths to share and DFS paths may be incomplete or temporarily unavailable. FSRM will retry the operation at a later time. Error: (0x80070005) Access is denied. Although this event doesnâ€™t affect quota functionality, the fact that it occurs hourly has prompted numerous support calls from customers. Weâ€™ve isolated the cause and the solution for this eventâ€¦well, most of the cause anyway. Why does this cause the event error? Because the DFS RPC endpoint is configured to allow both BUILTIN\Administrators access and BUILTIN\Users access, the latter of which is assumed to contain NT AUTHORITY\Authenticated Users (the default setting). Without NT AUTHORITY\Authenticated Users in the mix, the NetDfsEnum API fails to enumerate the domain-based roots because the FSRM service is authenticating with that identity. The resulting ERROR_ACCESS_DENIED error causes the event to fire. What we havenâ€™t solved is why NT AUTHORITY\Authenticated Users would be removed from the BUILTIN\Users group. Weâ€™ve looked for Active Directory guidance indicating this is a best practice, but we couldnâ€™t find any. We suspect that admins might intentionally remove this group in an attempt to increase security. So, to resolve this event, add NT AUTHORITY\Authenticated Users to BUILTIN\Users group on the PDC emulator. You can check this by launching Active Directory Users and Computers and looking in the Builtin folder for the domain. The Users group must contain the Authenticated Users group. If it does not, you can add it using the snap-in. Next, stop and restart the FSRM-related services (srmreports and srmsvc) on the file servers where FSRM is running. If you were one of the 39 people requesting updates on the article that Jabez posted a while back i will alert you ASAP with links to this article and the one at the File Cab. If you are trying to install Windows Vista RC1 in VMWare Workstation, you may see setup appear to hang on the text-mode screen that says “Windows is loading files…”. Actually what has happened is that Vista Setup is already in graphics mode trying to do things, but something about the way it switches the display adapter into graphics mode is not working right on VMWare. Since Microsoft makes a competitive product, Virtual PC, this is funny that they come out with a major new test release(Windows Vista RC1) that just not work on VMWare Workstation. Or Product team did not test this product with VMWare Workstation? But in my memory, I can recall that Microsoft also using VMWare Workstation before Microsoft has bought VirtualPC. You can get Vista installed in VGA 16 color 640×480 mode (it will look awful) and then when you get everything running, install VMWare tools and take out those two lines and you’ll be good to go.